When it comes to nature photography, a little bit of intuition and a whole lot of luck go a long way. Given that I live in the mountains of Lake Tahoe, it pays to be prepared. Several days ago, while going to run errands, I chose to mount my 200-400 F4 lens on my Nikon D800 camera body and place it on my passenger seat. After my final visit to the gallery frame shop I took a bit more scenic route home. 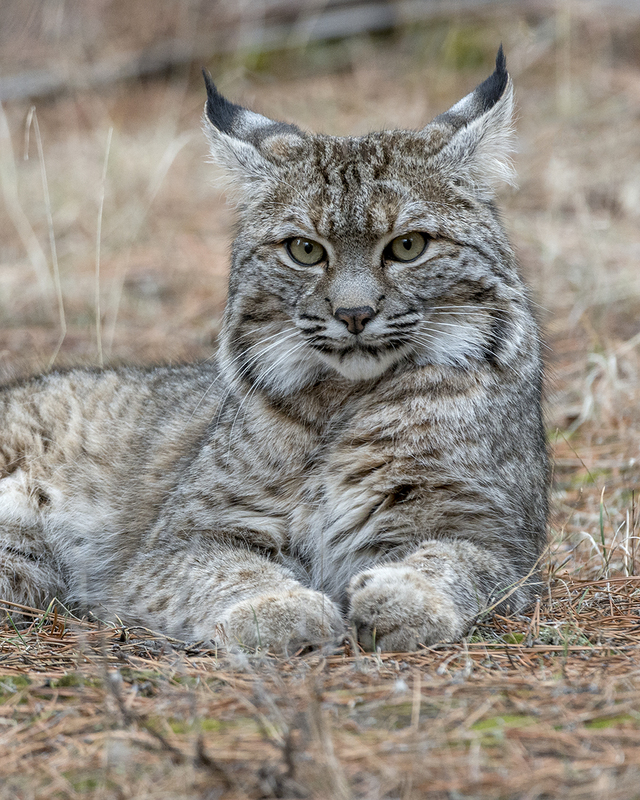 To my amazement, I happened upon the first bobcat I've seen in Tahoe. It was a joy to simply reach over, grab my wildlife camera and begin shooting. As I attached my camera to the tripod, I observed this beautiful cat wandering into a small grouping of pine trees and settling down to groom itself. I respectfully took a very wide approach in an effort to leave her undisturbed. Fortunately, I was able to find a vantage point through the branches that afforded a clear view of her face, and still enabled her to feel secure. (note: this portrait is a reasonable crop from the original.) Being prepared enabled me to take my time, observe from a respectful distance, capture a few beautiful images and enjoy the experience. When photographing wildlife I generally take a tiered approach. First, I compose a moderately wide frame and capture several "security images". I then quickly check my exposure and sharpness to make sure my camera settings are correct. I then settle in and feel what the experience is offering. With a stationary or slow moving animal, I observe the background carefully in an attempt to minimize distractions, and make a great effort to focus on the animals eyes. At this point, I am attempting to capture "final images". Images that will require minimal to no cropping, and have tack sharp focus where I want it. If necessary, I'll change my aperture setting as well as my iso setting. After a short grooming session, this beautiful cat sat up and slowly wandered off. If you would like to purchase this image for yourself or as a gift, contact me directly and I will arrange for a consultant to assist with you personally. Don't miss out on any of my photographic experiences or offerings. Subscribe to my FREE Fine Art of Nature Newsletter!